A chance for free money!!! So easy to enter!! All of these awesome people are participating. 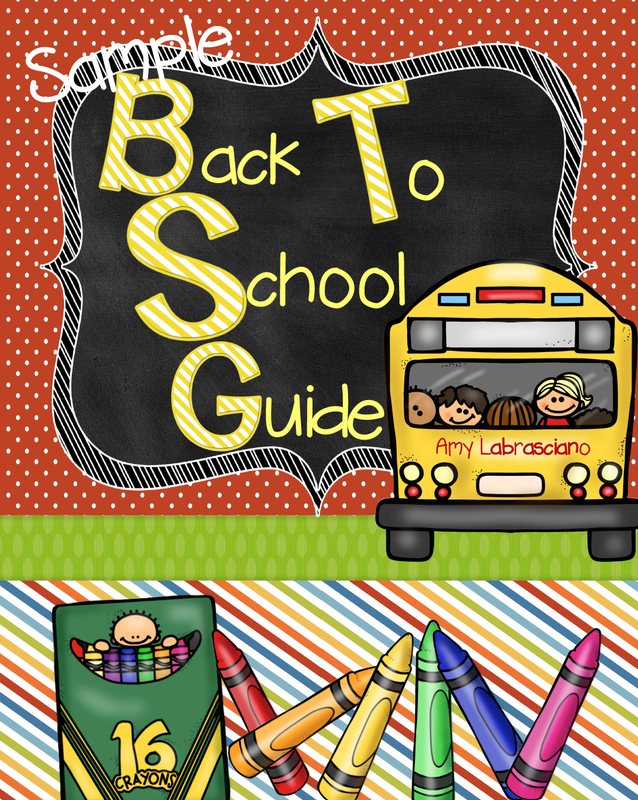 We are back this week with another great tip for back to school. This one comes from Coast to Coast Kinder! 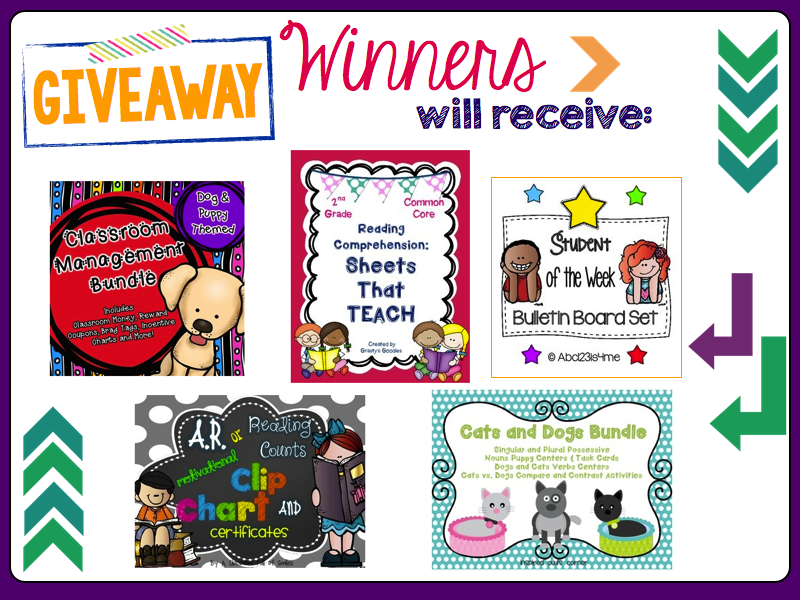 You HAVE to go check their blog and grab the amazing freebie they have for you. 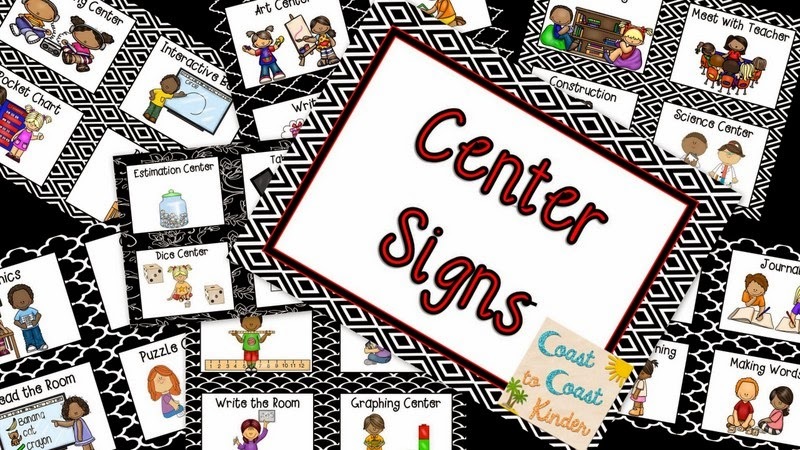 They outline how they run their classroom centers, but the best part is the set of amazing center labels you get for free!! 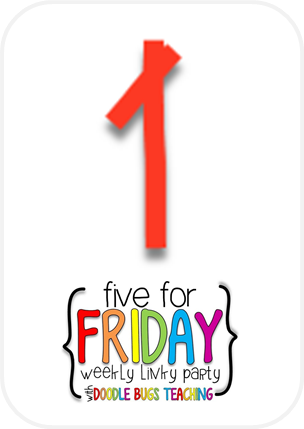 Click on the blog icon below! Stop by next week for another tip and freebie. 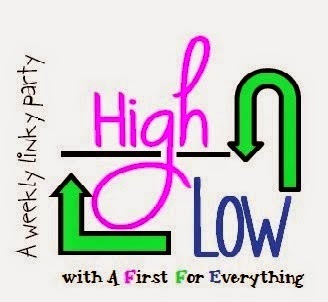 I am linking up with Julie from A First for Everything for her new linky party that recently started. We share some highs, as well as lows, from the week. SO I didn't get to post this yesterday, when it was supposed to go up, because I was too busy enjoying this wonderful HIGH! My husband's company had a picnic/fair for the all the employees. They pulled out all the stops and everything was free! My kids had a blast. My little one enjoyed the petting zoo, which was my favorite part too. All three kiddos got to go horseback riding! How cute is she with her oversized helmet? There was free food, free carnival games, free pictures, free bounce houses/slides, free boating, free swimming, free balloon animals, free arcade games, free, free, free!!! My older two even sat in the dunk tank and got dunked a bunch of times! My low also involves my little one! Ever since I came back from Vegas, her beautiful sleep routine of two years has vanished. She slept over my parents for the five days. And ever since we came back, she won't sleep in her room anymore. She figured out how to jump the crib the first night we got back. She kept on doing it no matter how many times we put her in there. If she would wake in the middle of the night, she just jumped out and came to our room. So we converted the crib to the toddler bed so she doesn't get hurt. However, she just won't stay in it anymore! And then I get too lazy to constantly go back and put her in there, so I guess I am also to blame for the destruction of the routine..but I'm tired! No, I am going to fix this mess this week!!! I think. 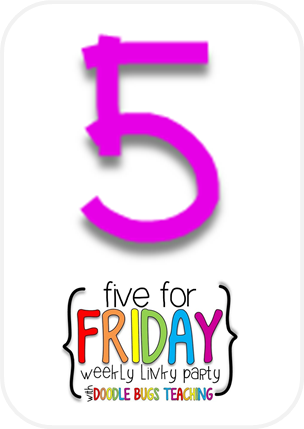 Check out the other great posts from everyone who linked up over at Julie's Blog. 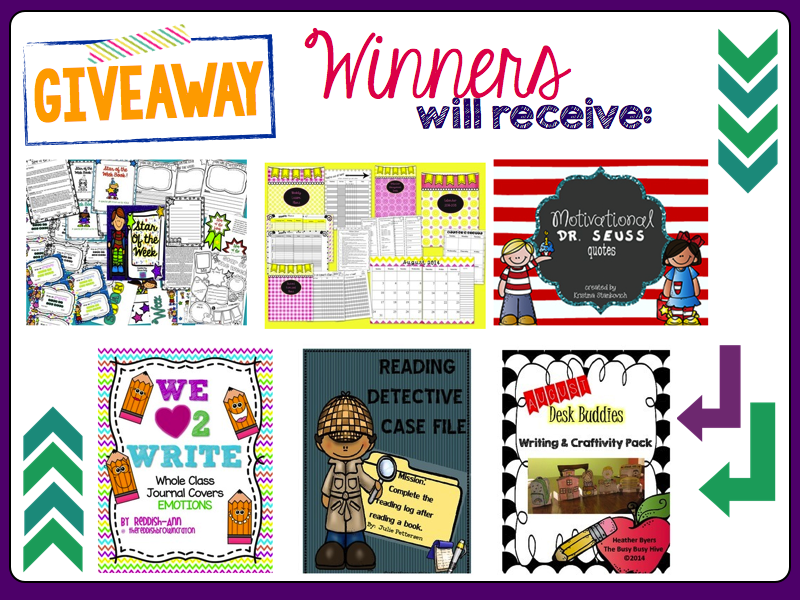 I am super thrilled to be able to get together with other teacher bloggers to present to you the TWO STARS AND A WISH Blog Hop. Each of us will be showcasing two ideas/tips/tricks that have worked for us really well to smooth the transition of a new year. Finally, we will be sharing one wish that we have on how we want to improve something. So let's get started! Two years ago I had book boxes. I bought those cardboard book holders from Ikea and had a tall skinny shelf that fit exactly the amount of kids (21) that I had that year. However, this year with 27 kids, that shelf wasn't going to do and there wasn't another feasible area in the room to house so many boxes. Instead, I tried the book bag idea. I bought Command hooks (get the ones that say they hold the most weight - I believe it is about 2 lbs). I printed number labels onto label paper and cut out the circles, then attached them to the wall above each hook. 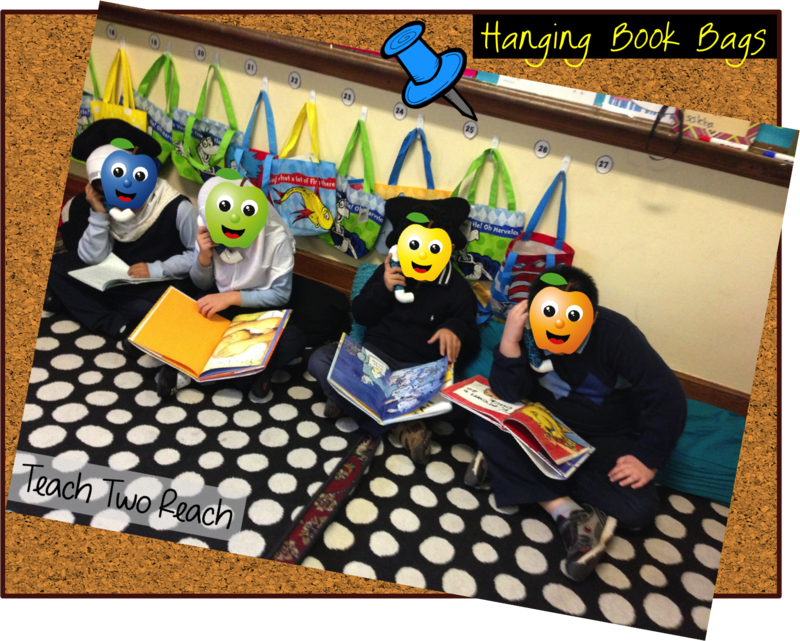 Then, I was lucky enough to find those amazing Dr. Seuss themed bags they sell at Target and bought a class set to hang from each hook. All year long, students could put a couple of books in there from the library. They put a notebook also to move through center/Daily 5 rotations. Through the year, if some kids put too much in there, the hook did fall off, so you really have to show students what the right amount of weight in there should be. But this method did work all year and it only took space that I probably wasn't going to use for anything else anyway. While we are here, let me point out the amazing effective-ness of Whisper phones you see my apple kids holding. They work wonders for keeping students to read in a very low voice instead of reading out loud. 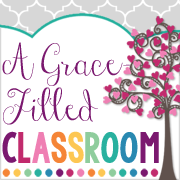 There are a ton of pics on Pinterest to guide you on how to make a class set. It's really cheap and easy!! Do you try to grab picture books weekly that fit a certain comprehension skill? I did that this year whenever I was introducing a new comprehension skill. I would try to get 5 picture books that worked. So what I did was I made a booklet for each skill. 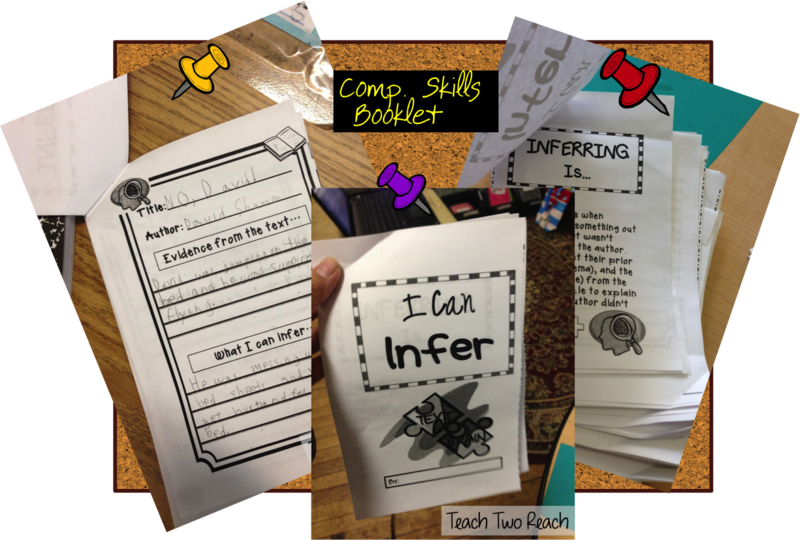 The name of the skill was on the top, a description of the skill was on the page after, and then there were 5 identical pages where students would use the picture book for the day to showcase evidence of their learning for that particular comprehension skill. In the picture above, we worked on inferring. Each day, I read a picture book that we could infer from. Then, they would go to a page, write the title of the book and author, the evidence from the text that they noticed, and what they could infer with that evidence. 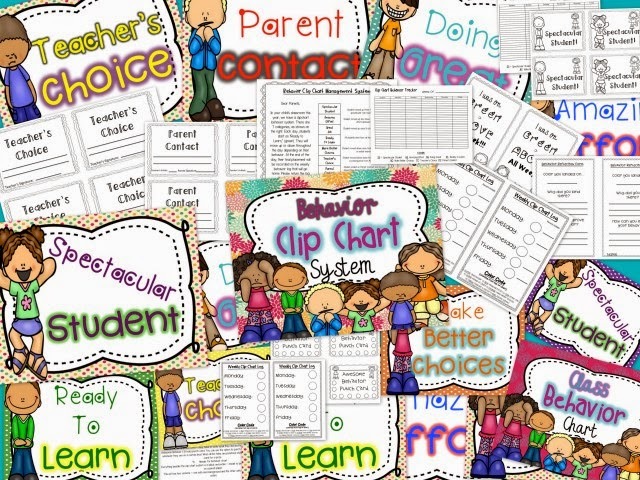 I loved this idea because they had the booklet with them all week long, no passing papers each day and leaving a paper trail, and I had a quick assessment at the end of the week. 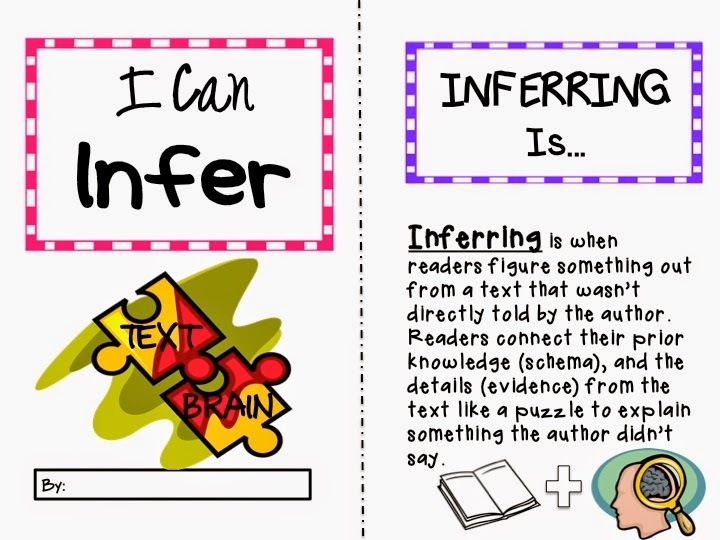 And guess what, you can click below to get your own copy of the inferring booklet! I don't know exactly why, but I didn't implement Star of the Week this past year like I always have in the past. I know whenever I used to do it, students would be so thrilled to be "featured," for the week. I would pick students randomly to be the Star for the following week. Each day, they brought in something to share. 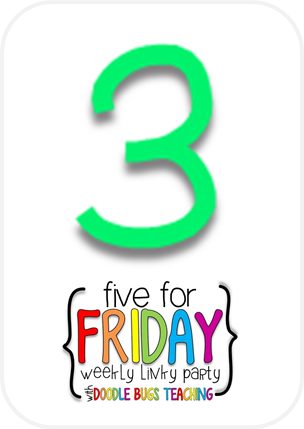 Monday would be a poster of themselves and additional pictures, Tuesday would include a show and tell item, Wednesday was a favorite read a loud, Thursday was an estimation game, but Friday was the best part. All the students would write a short letter to the Star telling them at least three nice things. And I made sure to tell them they can't just say, "You are nice." Whatever they said, they had to explain. Then, I would bind these books with a nice laminated cover and give it to the students. So anyway, I feel guilty that I just got too overwhelmed with everything going on this year, to implement it, and sorry to my last class for not doing it! So my wish this year is to start the program again. 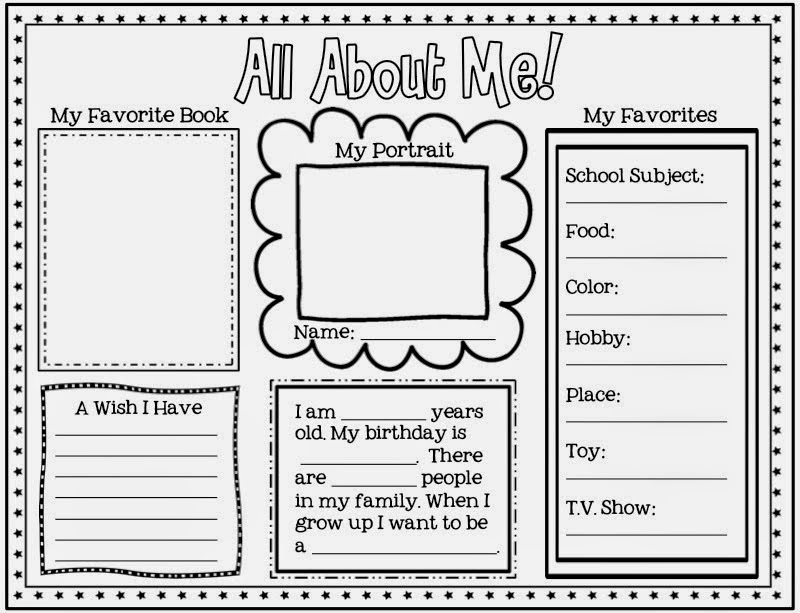 I revamped whatever I was using in the past, and made a Star of the Week packet that you can check out below. 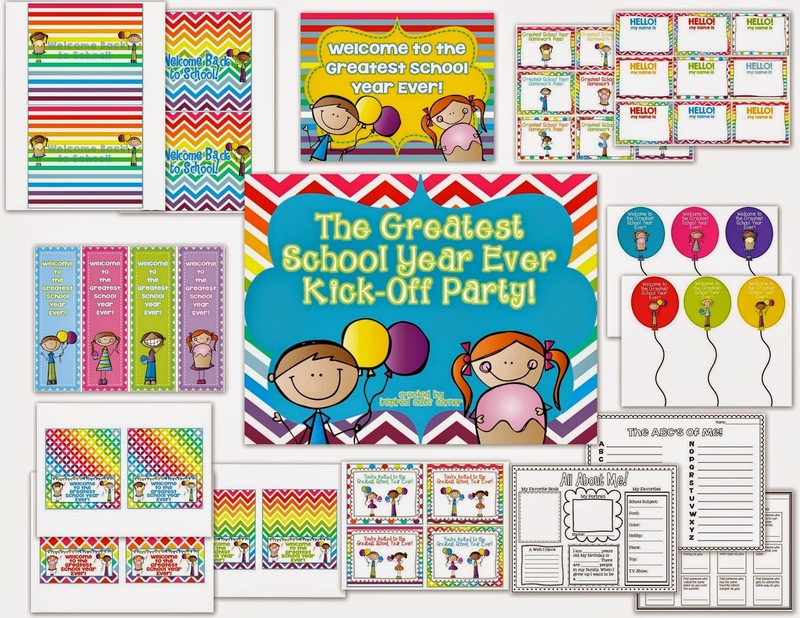 It has everything you need to get this program started, including an editable parent letter, and editable class book page covers. 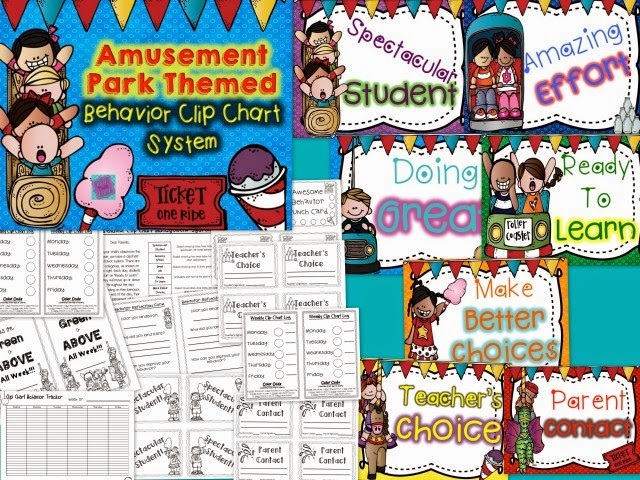 I'm excited to start the year off with this and get the students super excited! For more star ideas from more other bloggers, please browse through the link up below and choose a topic that interests you. I haven't done this linky since school ended...and also because my Iphone 16 gigs allows me no more space to take pics..like all I have on my phone are under 40 pics and I have no more space to take any unless I delete, and I can't delete them yet because they are all screenshots of ideas from all you amazing teachers, and I'm too lazy to upload them anywhere else....SO...that is the real reason I haven't linked up. 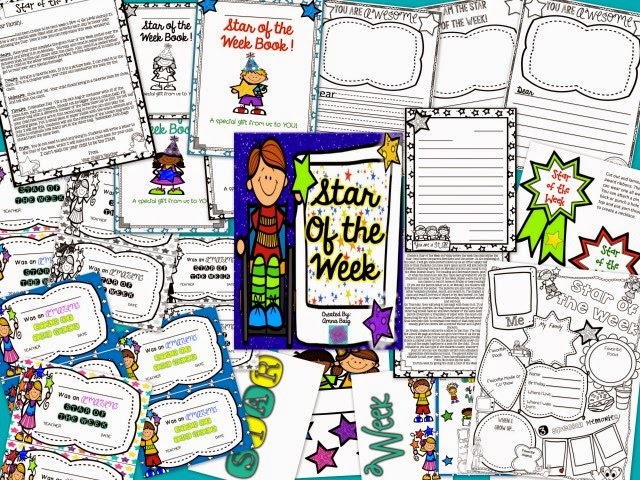 I created a Star of the Week pack...lots of stuff included, plus a poster you could use as is or print to ledger size to give kids to fill out when they are the Star of the Week. Click the picture to take you to see the product! 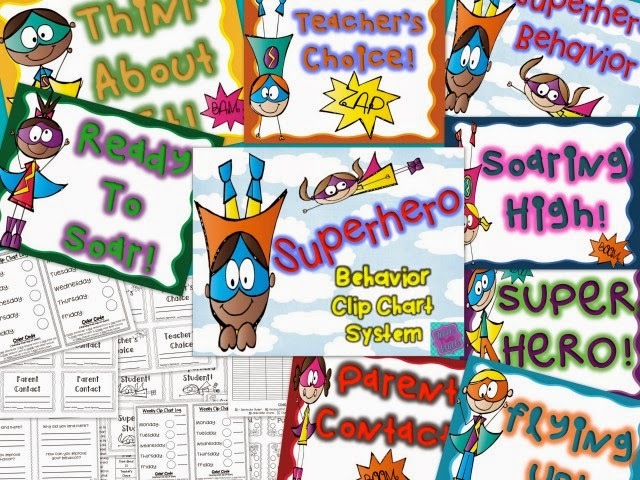 I've been making behavior clip charts for various themes. Here are four that I've created so far. Any requests? Maybe I could do it. P.S. everything in my store is 20 percent off today. 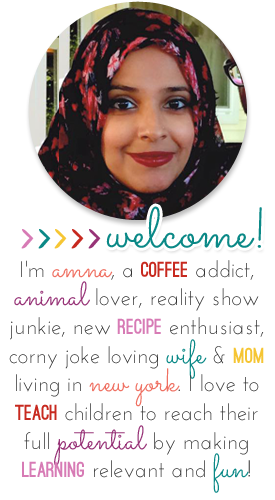 I've been trying to play around with html this week. I don't even know what html is. Whatever. I tried to mess around with it to enhance a couple of features on my blog. I didn't really have a nicely done navigation bar on the top. So I made those buttons. Took FOREVER to get it. 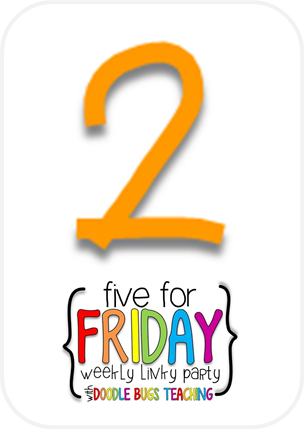 I also added a TpT widget and a Pinterest widget. Now there is a problem though with the TpT widget. I copied the exact codes off the site, but it is not showing MY products..it is showing other peoples' products...products I've perused, but still NOT MINE. Anyone know how to fix that?? 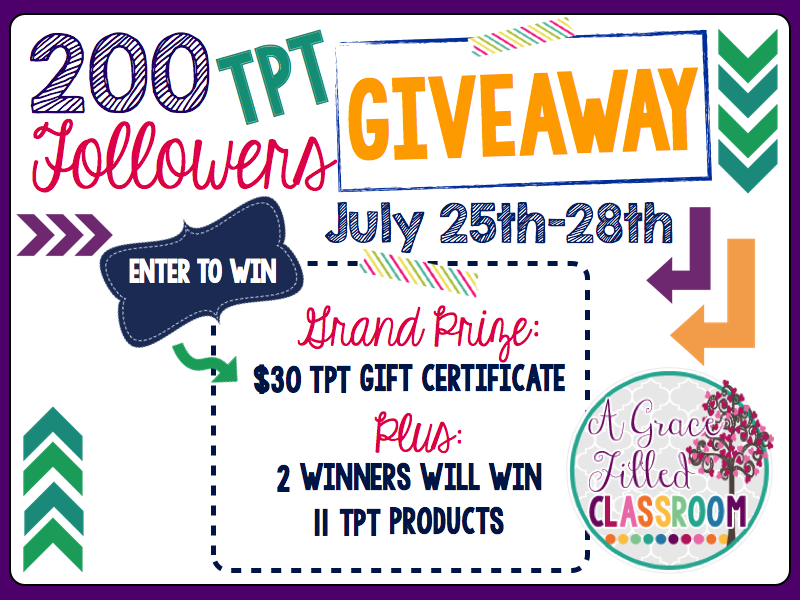 Laura from A Grace Filled Classroom is having a wonderful 200 TpT follower giveaway. I donated the above mentioned Star of the Week pack. Click on her blog icon below to take you to her site so you can enter!! Hi! 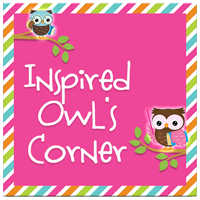 We are back this week with another Primary Peeps Tips and Tools for Back to School post wth Marissa from Inspired Owl's Corner. 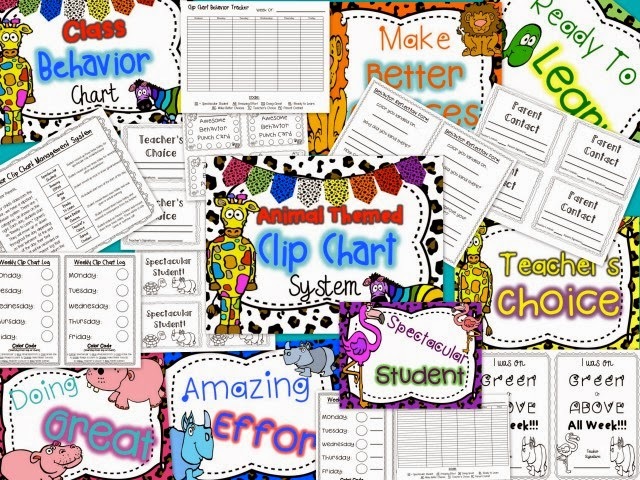 She brings you this amazing freebie to start off the school year and make the kids feel special. Marissa makes the most beautiful printables to use as decorations or create fun stuff with and you can find a bunch of stuff in her store. 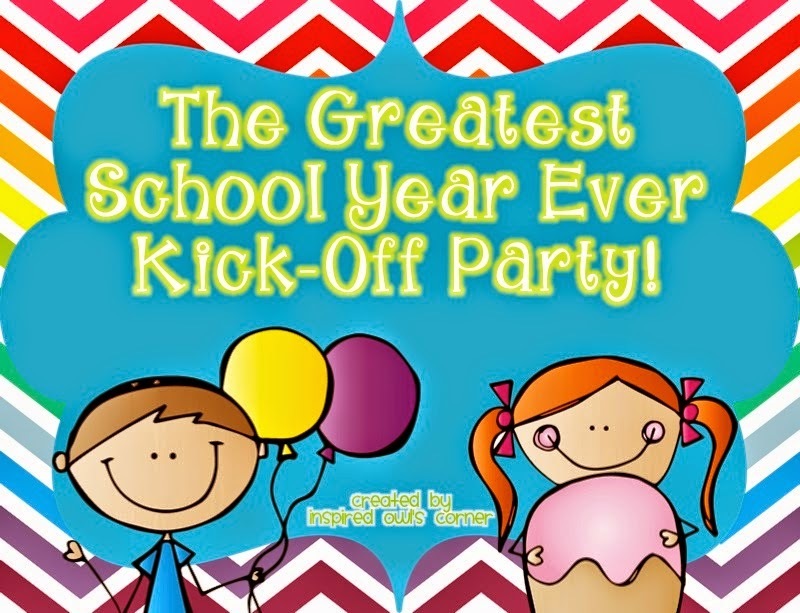 I love this new freebie from her because you get to have a "party," on the first day of school, and she provides you with everything you need to give out to the kiddos. Take a look at some pics below and then click on her blog button to take you to her post so she can tell you all about it and you can grab the wonderful set. I am back this week after a wonderful time in Vegas for the TPT Conference. 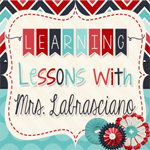 Amy, from Learning Lessons from Mrs. Labrasciano, was also there, and she is the contributor for this week's Tips and Tools for Back to School summer hop. I don't know how she had time to put it together, but it's a big one! 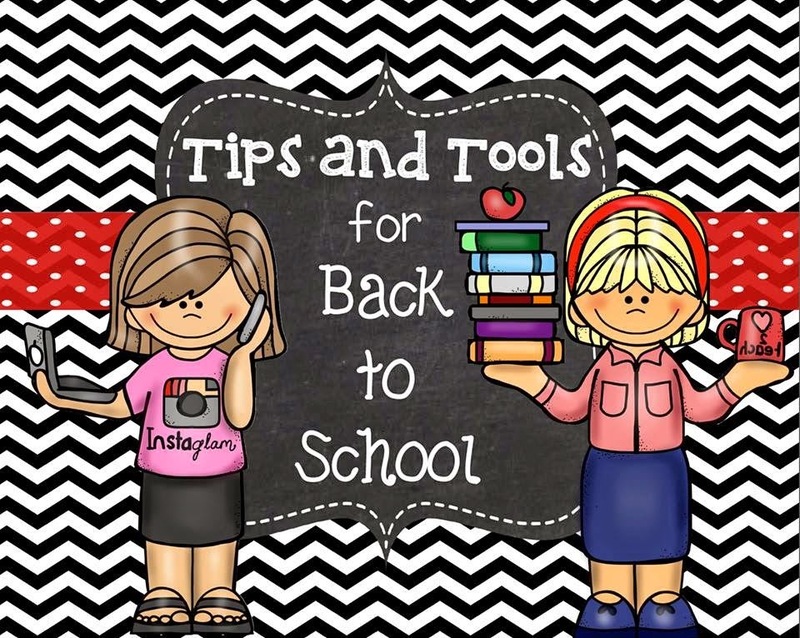 She has compiled a wonderful list of back to school preparation tips. 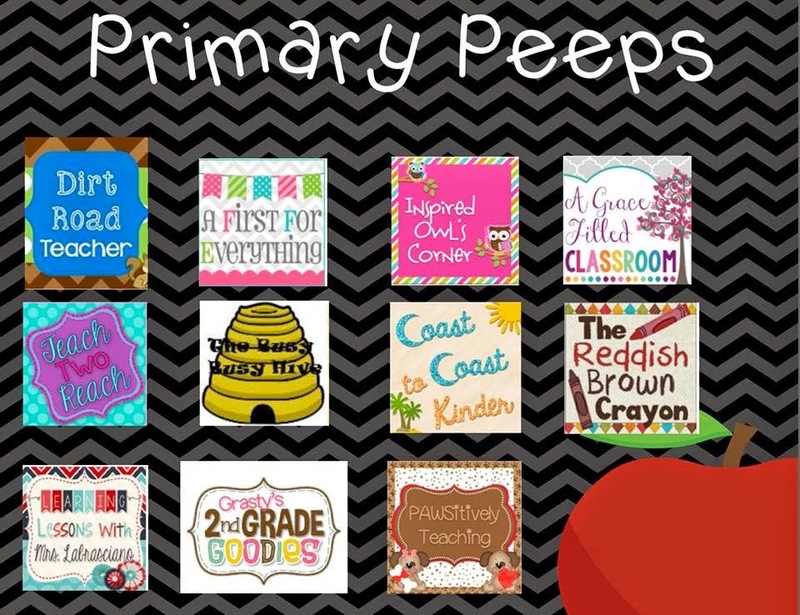 She's also provided an amazing resource of ink friendly classroom labels! If you're like me, you try to get your significant other to print colored copies sneakily at work because you don't have a great color printer. These labels from her will be awesome. 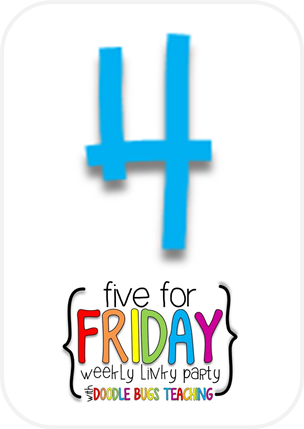 Check it out by clicking on her blog icon below! 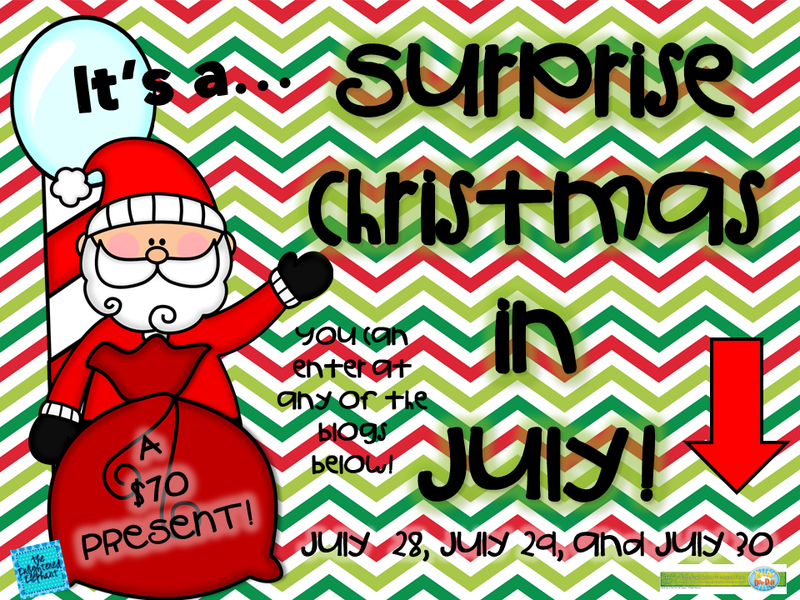 Shhh...Come in to see a surprise!